Vaccines are among the most effective ways to prevent infection. Before vaccines are introduced into publicly-funded immunization programs they are carefully tested to ensure they are safe and effective, with benefits outweighing risks. However, a few people will experience an adverse event (side effect) after receiving a vaccine and such events may raise concerns in children, parents and vaccine providers about the safety of future immunizations. Researchers and vaccine providers have more to learn about who is most at risk of experiencing another adverse event after their next vaccine or the best way to vaccinate those people. The Special Immunization Clinic Network (SIC) was established across Canada in 2013 by infectious disease specialists and allergists to provide expert advice to patients who had experienced adverse events following immunization and those who have medical conditions that may affect their immunizations. There are 11 special immunization clinics across six Canadian provinces: British Columbia, Saskatchewan, Nova Scotia, Alberta (two clinics), Ontario (three clinics), and Quebec (three clinics). 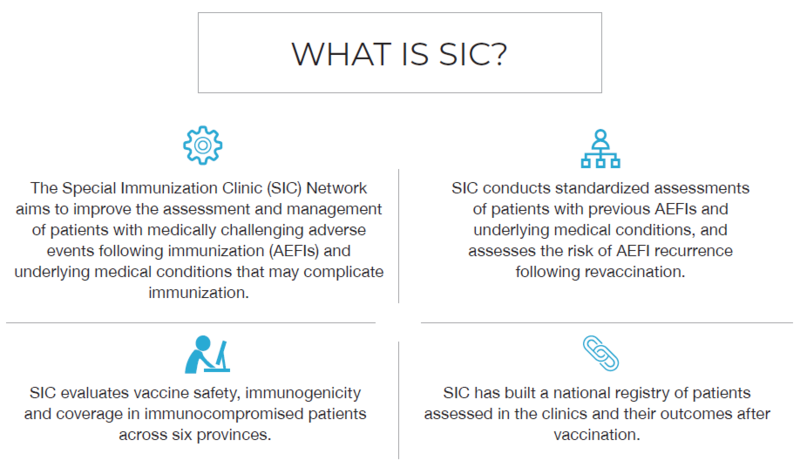 SIC physicians conduct standard patient assessments, and evaluate vaccine safety, effectiveness and coverage in immunocompromised patients. Results to date indicate that the risk of a recurrence of the adverse event is low in most patients and that such recurrences are generally milder than the first event. Vaccinating children after chemotherapy for acute lymphoblastic leukemia (ALL) is studying how well vaccines work and how safe they are in children with leukemia who have finished their chemotherapy. Enrollment is complete and results are expected in fall 2018. Immunization practices in children with primary immune deficiencies (PID) aims to describe vaccination practices of immunologists, pediatricians and infectious disease specialists caring for children with PID through a survey (results expected Spring 2018), and a review of medical charts of children diagnosed with PID before age seven (results expected in fall 2018). In 2017, the SIC network partnered with Public Health Ontario (Dr. Shelley Deeks) and Peel Public Health Region (Dr. Lawrence Loh) to deliver a successful workshop on Management of Adverse Events Following Immunization for immunization program managers and medical officers of health in the Greater Toronto Area. 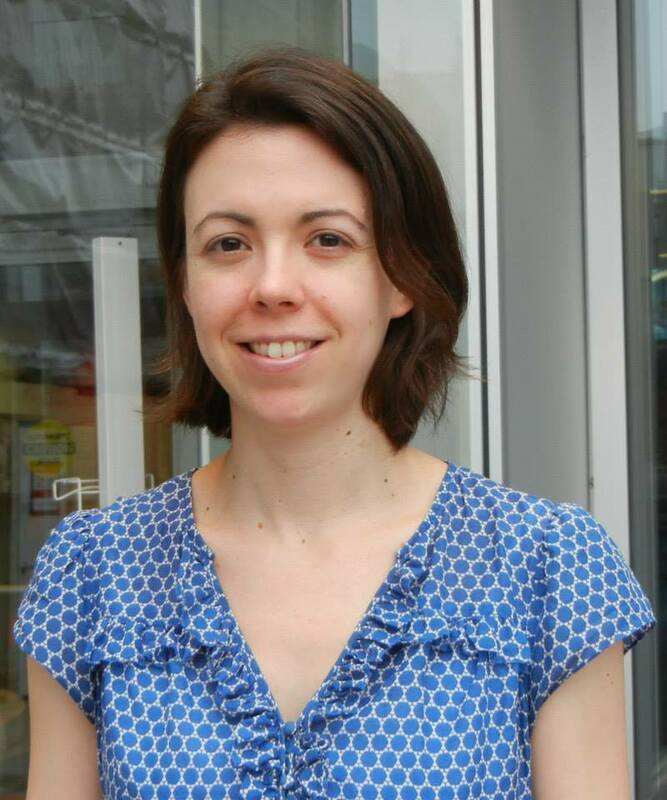 Dr. Joseline Zafack (PhD Candidate), led a systematic review of the risk of recurrence of adverse events following immunization that was published in the journal Pediatrics and led the update and revision of the SIC Network’s management guide. Canadian paediatricians’ approaches to managing patients with adverse events following immunization: The role of the Special Immunization Clinic network Paediatr Child Health , 2014;19(6):310-314. Immunization practices in acute lymphocytic leukemia and post-hematopoietic stem cell transplant in Canadian Pediatric Hematology/Oncology centers Hum Vaccin Immunother , 2016 Apr; 12(4): 931–936.